IRADe is designated as a Centre of Excellence for Urban Development on “ Climate Change and Urbanization” by the Ministry of Urban Development, Government of India since 2008. As a Centre of Excellence, IRADe addresses the issues related to urban development and climate resilience and renders support to national, state and local government in key areas of urban development and climate change. The Centre has actively participated and shared the requisite knowledge for the Service Level Benchmark (SLB) initiative of MoUD. The SLB has set the standards for service delivery in the area of water supply, waste water, drainage, solid waste management, e-governance and urban transport. It is likely that projects sanctioned under Jawaharlal Nehru National Urban Renewal Mission (JNNURM) will realize these standards. The COE-IRADe has shared the knowledge with the subcommittee on six areas of urban on development for sustainable habitat parameters (as a member). These were constituted as an initiative under the National Mission on Sustainable Habitat. 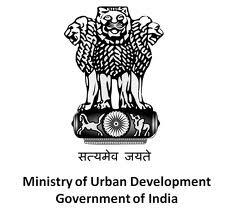 The data development committee for urban sector has been established by the MoUD, where COE-IRADe was invited as a member. As data availability for urban sector is a major concern for India’s growth prospects. Interaction with various state governments like, Andhra Pradesh, Gujarat, Madhya Pradesh and their climate change department has been initiated. The discussions have been carried out for expansion and scaling up of climate related initiatives. The experience and lessons have been shared with, UN-Habitat, World Bank, Department of Foreign and International Development (DFID, UK), German Development Co-operation, ISET, Rockefeller foundation, GIZ, and so on, to accommodate climate change related concerns in their upcoming investment and policy support programmes. 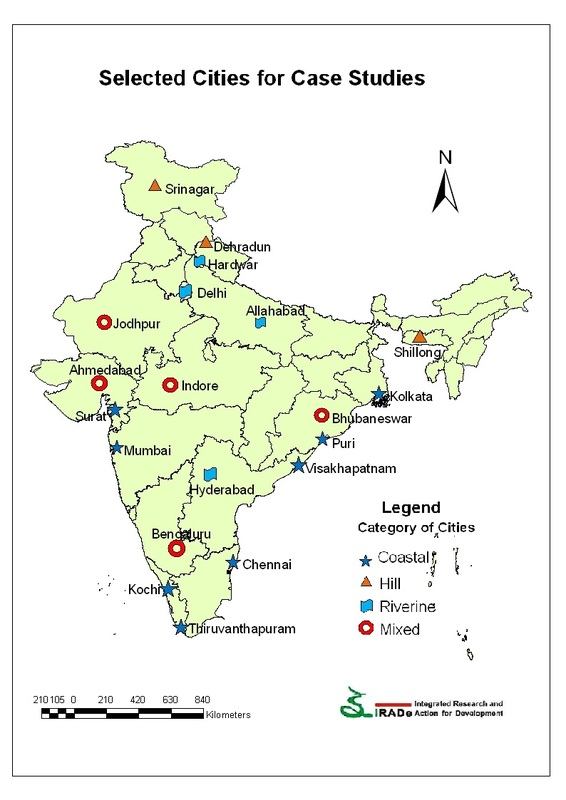 The study examined rapid assessment of vulnerabilities (RAV) of 14 Indian cities to climate change, based on climatic and socioeconomic indicators and addressed climate resilience factors for cities of India. RAV was done for 14 key cities in India based on various indicators of vulnerability to climate change, to strengthen national policy framework. In the climate resilience report for cities of India, IRADe studied urbanization and climate change in cities of Surat and Haridwar. The objective was to assess the nature of climate change induced threats to Indian cities and suggest measures for preparedness towards the same. On the basis of trends of urbanization and potential threats of climate change, the report highlighted that city infrastructure and development plans are inadequate to address the climate change induced vulnerabilities. This included review of city development plan of Surat and Haridwar. The study analysed the potential threats of climate change and adaptation options in urban planning. IRADe also aims to link the work to City Development Plans (CDP) and Jawaharlal Nehru National Urban Renewal Mission (JnNURM). IRADe is a national partner in the global programme of “Asian Cities Climate Change Resilience Network (ACCCRN)” sponsored by the Rockefeller Foundation and implemented by ISET. IRADe was selected as a national partner of the ISET for Indore, Surat and Gorakhpur. The main tasks of IRADe were to suggest measures to strengthen and improve the case studies/prototypes; determine mechanisms to mainstream the current work in the national framework for the benefits of other cities in India; establish national linkages; review networking arrangements and project documents; make linkages with national policies; examine and review city development plans; and participate in important meetings such as the Conference of Parties (COP) and make presentations. IRADe team visited all the three cities, met the city planners and official and reviewed city development plans of the cities. Climate resilience of cities with the events of extreme rainfall, temperature, floods, droughts, cyclones, storms, landslides is very important, especially, as the losses due to these extreme events can be many times more as compared to the cost of adaptation measures. Hence, a clear picture of the nature of the problems and which agencies, mechanisms or mission should address them is needed. This 20 city research was an initial step to identify the climate related vulnerability threat to cities. The study also identified current data gaps and further analysis required in the future. The main objectives of the study are: (1) reduce disaster risk in urban areas by enhancing institutional capacities to integrate climate risk reduction measures in development programmes as well as to undertake mitigation activities based on scientific analysis; and (2) enhance community capacities to manage climate risk in urban areas by enhancing the preparedness. The study is scoped to conduct a review of the CDMPs with a view to assess the clarity, comprehensiveness, efficiency, appropriateness, and dissemination including the integration of climate risk management measures in the CDMP planning process and plan document. Secondly this assignment aims to provide specific recommendations and provide strategies to each city administration in addressing gaps established during the review process to update the CDMP. The research paper highlights the links between climate change and cities, and discusses why cities should be concerned about climate change and how cities can build climate resilience. 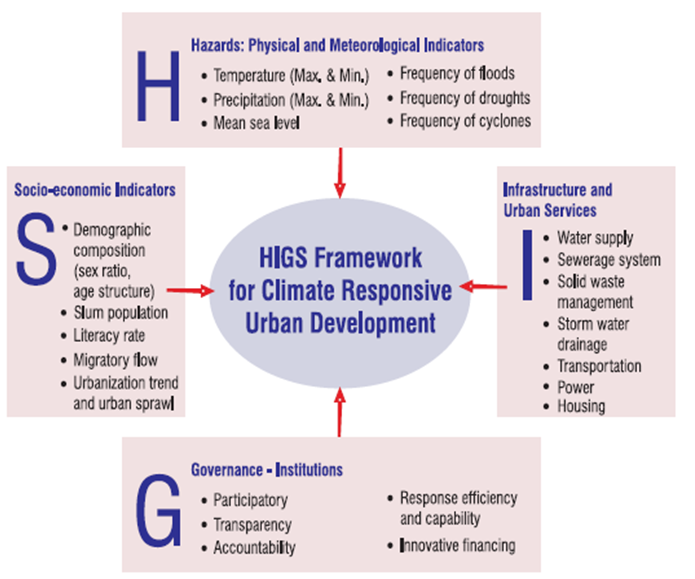 The objective of this study is to present HIGS framework as a customized and holistic approach that can be used for rapid assessment of climate vulnerability and sustainability. As a result, planners, decision makers and other relevant stakeholders shall be provided with a theoretical as well as methodologically well- grounded indicators, to develop climate informed urban development interventions while understanding the urban systems at risk. 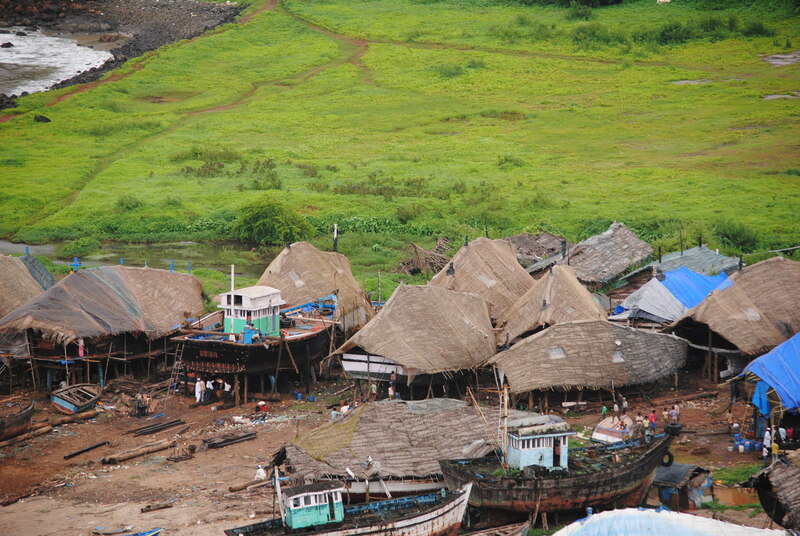 IRADe has developed methodology for climate vulnerability assessment and adaptation on various components of city infrastructure, which is available on http://www.urbanindia.nic.in/programme/lsg/C_Excellence_Minutes.pdf. For suggesting measures for adaptation to climate change and reforming the current urban development plans, IRADe’s research study has examined city development plans, local governance system, available research studies etc. and has done the field survey to evaluate the programmes of urban development in the context of climate change. This study was done to understand and address scientifically the problems of cities on river basins and adjacent to sea coast due to impacts and threats of climate change in urban areas and take measures to strengthen resilience of cities. Moreover, hydrology and hydrodynamics of the region under the threat of climate change have to be understood along with economic constraints and opportunities, and prevalent demographic dynamics. Cities on the river banks are particularly vulnerable to flooding when heavy rains in the catchment areas occur. Vulnerabilities of different wards or localities, groups of people, industries, commerce, and city infrastructure were assessed to identify what actions can reduce their vulnerability and make the cities resilient to climate change.